“What a way to spend a romantic weekend in Bath. We decided to celebrate by picking one our top items in our ‘bucket list’, a hot air balloon ride for 2 from the middle of Bath. 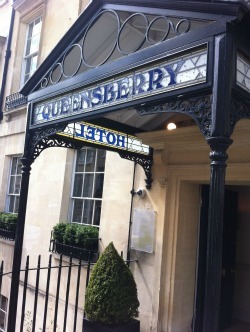 We stayed at The Queensberry Hotel, which has to be one of the most beautiful hotels in Bath. It has a slightly eccentric layout but is definitely relaxed with an astonishing attention to detail – it’s the perfect boutique hotel from which to explore Bath. The Olive Tree Restaurant was busy on the Friday night, but the food was exceptional and you could see why they had been awarded 3 three AA rosettes. That evening we had the call from the owner of the ballooning company confirming that we would be flying as expected on the Friday morning. Suffering from vertigo, I wasn’t sure this was good news. The hotel provided breakfast at the ungodly hour of 5.30am so that we would be ready in time for the 6.30am briefing in the Royal Victoria Park. It was only a 5 minute walk and the morning was chilly but beautiful. 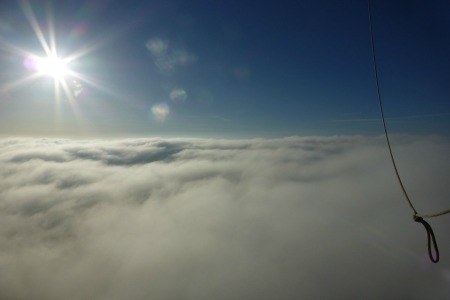 A call came through from Bristol to say that low cloud was working its way across to us – panic! They started to inflate the balloon just as the cloud began to cross the park, and we took off 10 minutes later into rapidly disappearing blue sky. As we rose above the buildings at the edge of the park, we had brilliant views of the whole city. Two minutes later we rose into the cloud and came through the other side to a stunning view of the sun pitched across a bank of clouds. Breathtaking to say the least, and as for the vertigo, well it never crossed my mind. The cloud went one way and we flew across it and into the countryside with perfect views of rural Somerset, including many villages such as Castle Coombe and the market town of Bradford-on-Avon. It felt so still that you could hear the noises of cattle, sheep and chasing dogs clearly all through the flight. The hot air balloon ride lasted 50 minutes and with a gentle landing we then celebrated with champagne after helping to pack up the balloon. Tell us about your high-flying adventures.